When I tell people I’m MCN’s Office Manager, they assume I’m tied to my desk and most of the time I am but not this week. My daily ride is a Honda X-ADV and over the last seven days I’ve had the chance to swap it and ride the latest maxi-scooters from Yamaha and Suzuki. I’m curious to find which is the best…. Where have I ridden: 6200 miles over the last six months, including various trips to the continent and my daily commute. I’ve lived with the X-ADV for six months and lost count of the amount of times I’ve tried to explain to people what it is. 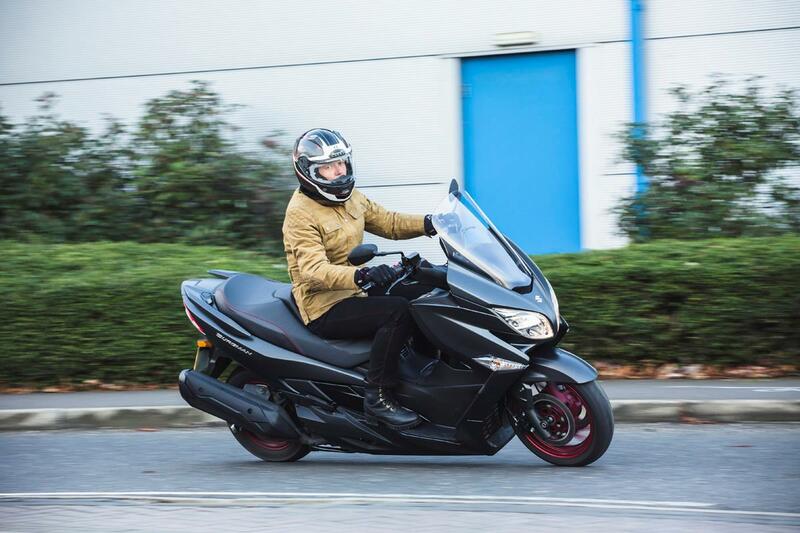 While the footboards, under-seat storage and semi-automatic DCT gearbox are scooter-esque, the upright and taller riding position err towards being a traditional motorbike. It is the heaviest and has the highest seat of the four machines, and more difficult to manoeuvre at low speeds because of the wide bars and weight but it is easy to filter. It requires more maintenance than other scoots because it’s chain driven and not a belt drive. Unlike a traditional maxi-scooter it has a 17-inch front rim. I’ve recently swapped the off-road style OE tyres for a set of sports tourers (Dunlop Roadsmart III) they’ve increased my confidence on slimy, winter roads. A top kit to maintain your bike over winter! Honda’s DCT gearbox is a bit clunky and you can find you are in the wrong gear at times. Manual mode is pointless and the two automatic modes (sport and drive) make much more sense. I opt for sport mode, which holds gears longer, and make the bike spritelier. The top box is fitted as standard, both it and the lit, under-seat storage, where there’s a 12v charger, are large enough to hold a full faced lid. It’s a shame there’s no glove compartments, another reason I don’t think it’s a scooter. I’ve fitted Honda’s accessory ‘Comfort Pack’ (£835) it includes fog lights, crash bars and heated grips. The grips combined with the handguards, which come fitted as standard, keep my hands warm. Where have I ridden: a 700 mile round trip from the UK to Paris for a group test during July and a trip from the NEC Show to Peterborough last Sunday. If Carlsberg made scooters, they would make the TMAX. With heated grips and seat, electrically adjustable screen and cruise control it is the best of the bunch but comes at a price. The plush, wide seat is sofa-like and the riding position roomy. Combine luxury with gadgets such as cruise control and I could ride all day. It would hold its own with sports bikes on the open, is nippy around town and eats up motorway miles but it’s not the most fuel efficient. There is plenty of under seat storage and in the lockable glove compartment, there’s a 12v charger. The dash is detailed and the clocks clear and at night they’re bright, making them easy to read. 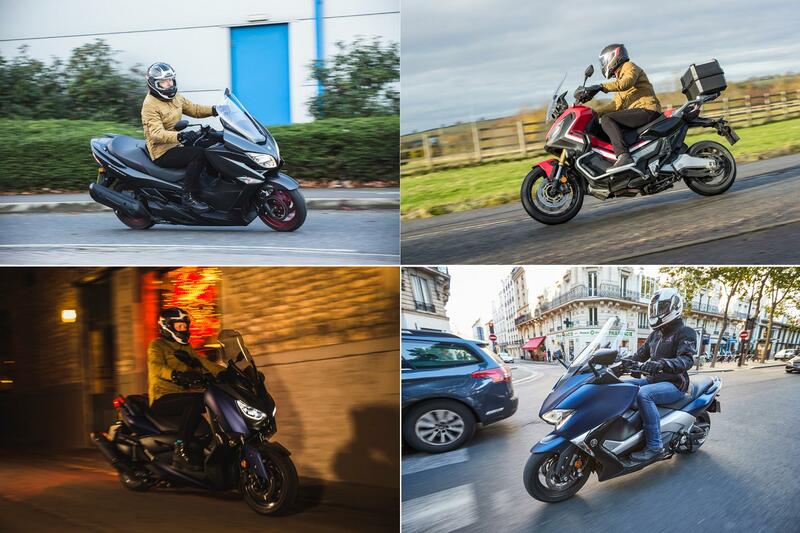 The TMAX really is the last word in luxury. This is the only scooter that has an electrically adjustable screen, which is great when swapping between town and motorway riding. The heated seat’s efficient and the lowest setting is bum warmingly good, even in near freezing temperatures. The heated grips are quick to get to temperature but they’re not as good as the X-ADV heated grip and handguard combo. 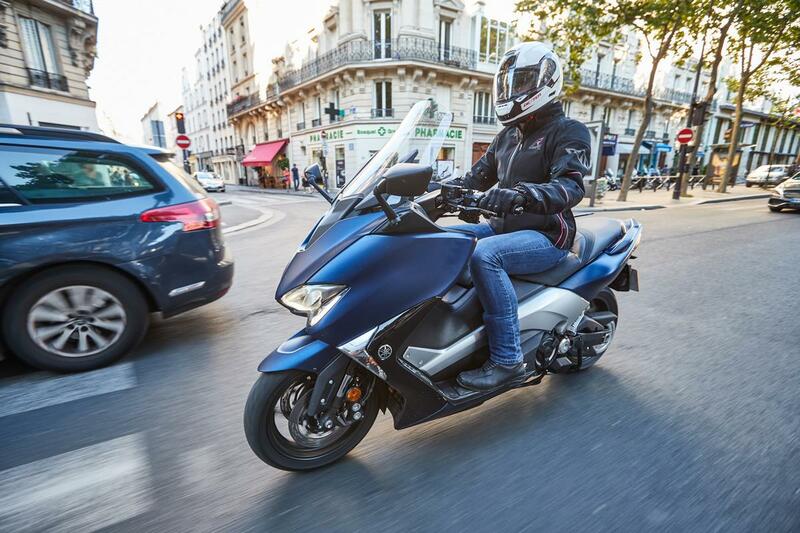 Keyless ignition and various security features, including an immobiliser and centre stand lock, are Yamaha’s attempt to keep thieves at bay. Where have I ridden: a 500 mile round trip from the UK to France for the launch in October. Group test with the Burgman 400 around Lincolnshire last week. At £5999, the X-MAX 400 is great value for money and is top quality. It feels a bit cramped and there is not much leg-room, the handlebars are two way adjustable and I prefer them set closer to me. The screen is mechanically adjustable, it’s fiddly to alter and once in place will need to stay where it is. 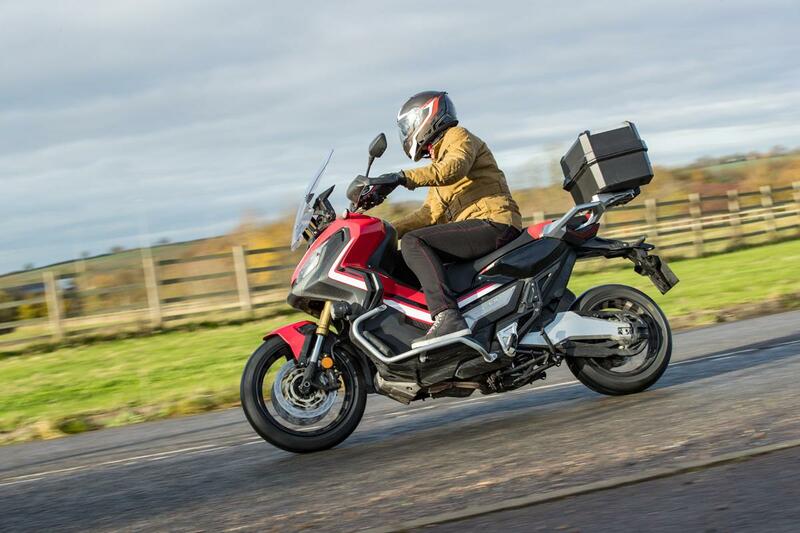 The 15-inch front wheel and short wheelbase (50mm less than the Burgman 400) make it nimble and manoeuvrable about town and traction control inspires confidence in tricky conditions. 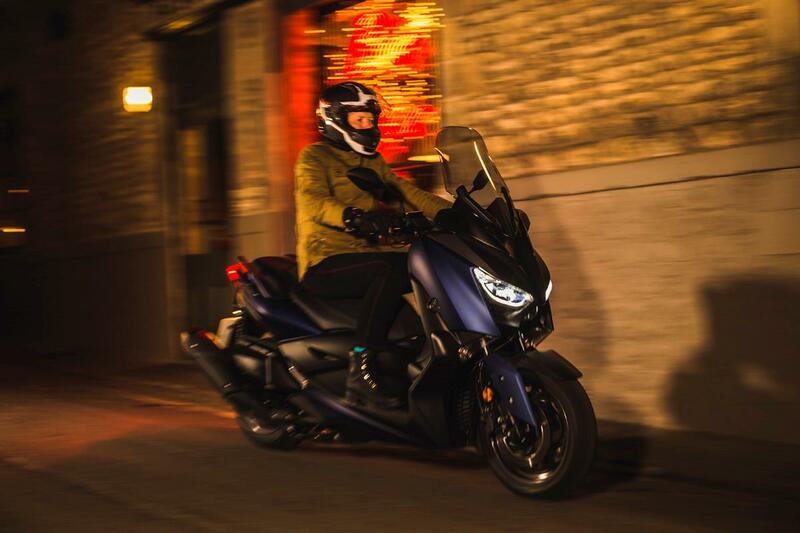 Under-seat storage is larger than the TMAX and it’s lit. There are two decent sized glove compartments, one is lockable and is fitted with a 12v charger. Like the TMAX and X-ADV it comes with keyless ignition and an alarm sounds if you leave the bike without switching it off, annoying but useful. There’s also an immobiliser fitted. Yamaha offer a whole host of aftermarket parts and the bike I’m testing has three-stage heated grips (£134) fitted. They are fast heating and keep my hands warms but would have been better if they’d got handguards like the X-ADV. Where have I ridden: a trip around the City of Turin and surrounding mountains at the launch in July. Group test with the X-MAX 400 around Lincolnshire last week. With its low, well-padded seat and spacious cockpit, the Burgman is comfortable. It has narrow, cutaway footboards, which make it easy to get your feet down, so it’s great around town. Suzuki have increased the front wheel from a 14-inch to 15-inch rim on this updated model. This helps make it more stable at speed but it is still nimble around town. The 30.5bhp single cylinder motor is punchy and has enough grunt for longer jaunts. It has a stylish, angular rear end that looks good but compromises the under-seat storage space and makes it the smallest of the four. There are two glove compartments, one has a 12v charger, and neither are lockable. It does a claimed 70mpg, which gives a tank range of 200 miles. An Eco Drive indicator reminds you if you get throttle happy and helps improve fuel economy. Like all the other scooters here, the Burgman comes with an immobiliser and there's also an entry point in the frame to secure a chain through. Unusually it doesn’t have keyless ignition but there’s an anti-tamper flap to cover the lock when it isn’t in use. I’d have the TMAX sat in my garage right now, if money were no object. It’s the last word in luxury and great fun to ride. The X-MAX comes a very close second, it may not come with a massive price tag but that doesn’t mean quality and comfort are compromised. It’s a great maxi scooter but without the maxi price tag. The Burgman doesn’t stand out but is a great all-rounder and the most fuel efficient. What I have learnt is the Honda X-ADV is definitely not a maxi-scooter, it’s in a niche of it’s own.